Candles can be quite easy to make if you use traditional kitchen items like pots and spoons, or you can invest in high quality candle making materials like a metal candle pitcher and wick holder. 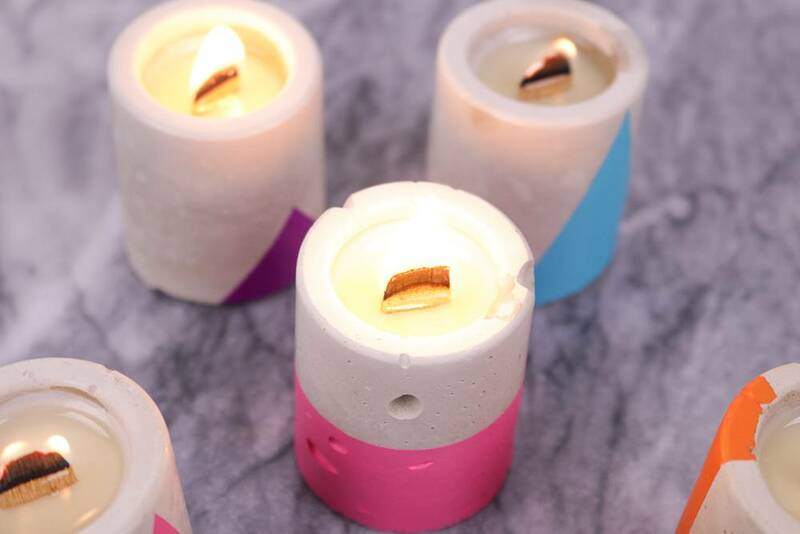 No worries though – with wax and wicks, you can make these candles without any special tools. Traditional concrete from a home improvement store works just fine for this project, and it’ll give you that cool, industrial vibe you want for your home, and these candles make perfect, thoughtful gifts. Plus, you can customize them with colorful paint if you want a pop of color. These measurements make about 5 small candles. Make the concrete cups by mixing about 4 cups of powdered concrete with 1 1/2 cups of water in a small bowl (disposable is better). It should be fairly liquid. Note, measurements may vary according to brand, so always check the package instructions. Pour into clean silicone cup mold so that it reaches all the way to the top. Tap the mold lightly on a surface to release any air bubbles and use a knife to level the tops as best you can, cleaning up excess concrete right away. Set aside to dry overnight or for several hours. Once cured, remove the concrete cups from the molds. If bottom is rough, you can try sanding with a piece of sand paper. Prepare the cups for candles by attaching a base to a wick, whether wood or wax. Measure its height and cut off the excess wick that sticks above the cup. Add a drop of hot glue to the bottom of the wick base and press to the middle of the inside of the containers. In a metal candle pitcher or a small saucepan, heat the soy wax flakes on low heat. Attach the candy thermometer and heat until reaches about 125 (this is the melting point of the wax I used, but check the packaging for variations). Once melted, add the fragrance (at this point, you can also add color if desired). Stir gently but thoroughly for about 30 seconds. Carefully pour the hot wax into your prepared concrete containers. You should leave about ¼ inch of wick protruding from the wax. If the wick moves around, use popsicle sticks or a wick holder to keep it in place (but I did not have this problem). Allow to cool for several hours until the wax solidifies. At this point, you can paint the containers if desired. I simply used masking tape to block off triangles or stripes and painted one coat in bright colored acrylic paints. Within a couple hours, your candles should be ready to burn! In my experience, the products I used allow the candle to burn for long periods of time, and I love that the wood wicks add a quiet crackling sound (which I personally enjoy). @Sara The mold is actually made by Wilton and originally designed for cookie shots! You can often find them in the baking section. I'm not sure what brand the cement was...it was standard powder from a hardware store. I hope that helps! Hello!! I Just got in to making cement planters and such. Where did you find the tray of silicon molds? I have bought individual, but I couldn't find one like yours! Also, what brand of concrete are you using? Your candles are beautiful, I can't wait to give your method a try as I love candles. I tried to make concrete candles once but failed as the concrete cracked when exposed to the high temperature of the candle flame, any suggestions of how I can prevent the cracks from forming ? hi, I was told that a clay flower pot or cement has pores and need to be seal before adding the wax. true or false ? and what sealer would be ok to use if I want to use fragrance oil with soy wax ? Hi! Thank you for this tutorial - they turned out beautifully. However, for the LIFE of me I cannot find a silicone mold like yours. They are only being sold individually for $30 each in China. Can you share where you bought the mold? You are liers. This is not easy, not quick project.